The 2013 model of the Lotus Exige was just spotted by our spy photographers. After almost a month hiatus, Lotus has brought their 2013 Exige out of the compound for some more testing. The new photos reveal quite a bit more than the previous spy shots we brought you and they are much clearer than the previous shots. Our photographers have caught both the front and back of the new Exige, including its longer rear complemented with a rear wing. The 2013 Exige gets a nose job similar to its mate the Evora. It appears that even the roof has received some new design lines. 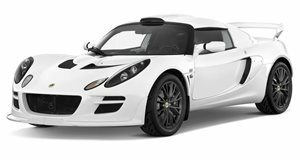 We also think that the new version Exige could pack the Evora&apos;s 3.5-liter V6 that has an output of 280hp and bumped up to 350hp in the S version. Our spy shoots also noticed that the mules in the photos are a bit larger than the older models, meaning that the new Exige should also be a bit wider as well. Bigger brakes were also spotted on the mules to handle the added power. The 2013 Exige is expected to make its debut at the 2012 Geneva Motor Show. Pricing is estimated to be around $85,000.